At Wo-Jo’s Construction, we work on our fair share of kitchens – from project inception to project completion, we work tirelessly to make our clients’ dreams come true. We’ve specialized in kitchen design in Massachusetts for over a decade now, so are always “in the know” when it comes to trending design styles. We’ve all seen kitchen design styles change over the last few decades. Long gone are the days of drab, 70s Formica tables and chairs as well as the 80s use of outlandishly large kitchen cabinets and appliances. When it comes to kitchen design in Massachusetts these days, people are opting to combine both form and function in ways that keep inspiring us. Now, we’d like to share what we’ve seen to be trending kitchen designs in Massachusetts for 2015. 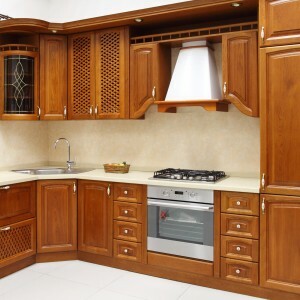 Wood cabinets – The classic wood look will simply never go out of style but, nowadays, people are paying extra attention to the type of wood species they use as well as the wood stains they use. Oak is becoming more popular in general while combining different types of wood is also a modern phenomenon. Cherry wood is becoming more popular in urban areas while driftwood-themed colors are also hot right now. From blonds to greys to dark amber and everything in between, beautiful wood-themed kitchens are all the rage. Minimalist white kitchens – White is one of the hottest new “neutral” colors being used in kitchens today. A classic white easily lends itself to almost any décor and provides a somewhat sterile, clean look that works perfectly in kitchens. Metallic/Gray cabinets – Next to white, gray is becoming one of the trendiest new “neutral” colors because it is a relatively safe choice. We’ve found that many people are opting for gray and metallic colors over the khakis, beiges and camels that were popular during the last few decades. With technological advancements in metallic paints, giving your kitchen a metal-like look is really proving to be a 2015 mainstay. Warm metallic accents and fixtures – People want their kitchens to be welcoming environments in which friends and family can gather together. And nothing says, “Come on in!” like warm colors. Copper and brass accents really make an impression when used to accent a kitchen’s overall décor. Colorful or white sinks – For those out there who want to use warm colored metal accents in their kitchens, white, instead of stainless steel, is a perfect option. Sinks that have warm colors themselves are also great ways to match any warm colored décor in your kitchen. Classic white goes well with anything.